A startling new era for Marvel’s armored Avenger begins in Invincible Iron Man #593 as Marvel Legacy gets under way. The comatose body of Tony Stark has vanished! 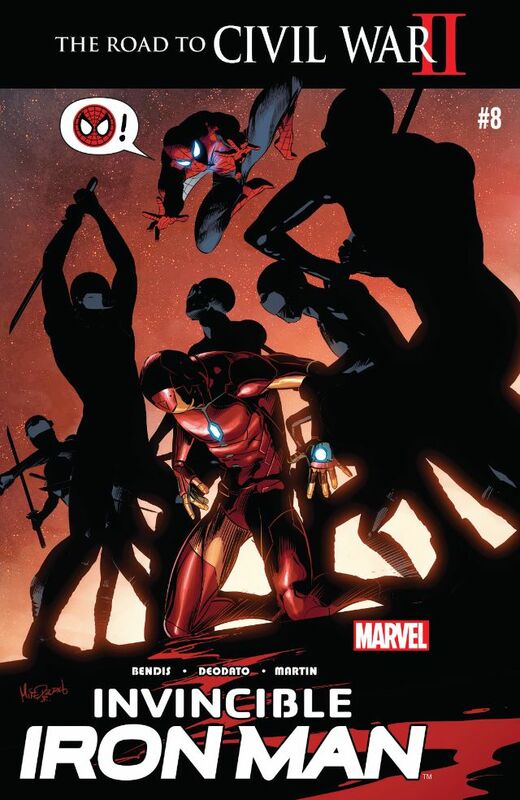 Now it falls to Stark’s friends and foes, those who have overseen his business interests and assumed the mantel of Iron Man since his battle with Captain Marvel during Civil War II left Tony in a medically unexplainable coma, to finally decide who will succeed him as the Invincible Iron Man! Well, now that we’ve got all the hoo-ha with Secret Empire out of the way, Marvel can concentrate on getting things back on track with Legacy. To be honest, this is bit of a quirky issue of Invincible Iron Man, there is a sense of getting back to basics and core elements of the character, which I guess is what Legacy is meant to be all about, and the return to the series’ original numbering – along with a great cover by Adi Granov – gives you a real sense that you are witnessing the start of something with great potential here. The issue is positively bursting with insightful character moments and exposition, and writer Brian Michael Bendis keeps Invincible Iron Man #593 on an even keel as he skilfully juggles the numerous plot threads. 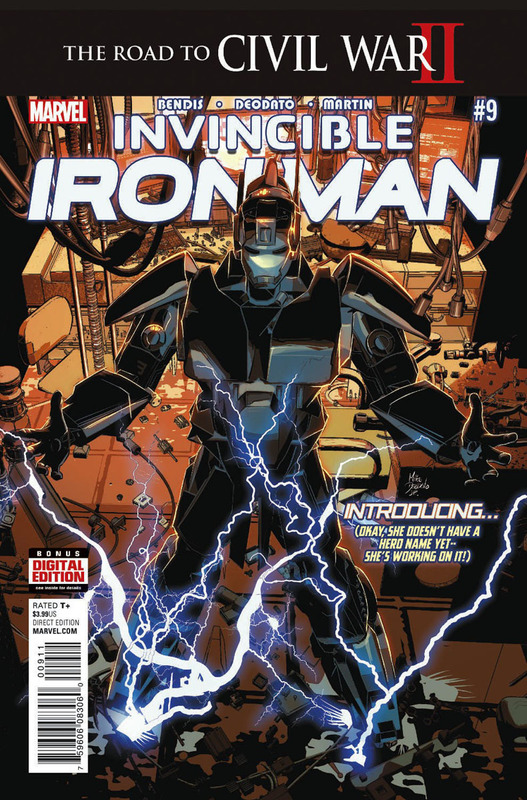 Tony’s AI, Friday is every present throughout, quickly brining us up to speed with current events: with Tony’s condition in stasis at a Stark Facility, Riri Williams role as Iron heart (whose Armor is run by an AI downloaded from Stark’s consciousness), and Victor Von Doom’s self-proclaimed path to redemption as the Infamous Iron Man. The Star Expo that opens the issue, overseen by Stark’s Mother, Amanda, and Mary Jane Watson, is a poignant affair tinged with both sadness and hope; despite the dour board of directors resolve to spoil the party. Throw in the mystery of Tony Stark’s body going missing and a tense face-off between the Thing and Victor Von Doom after an incident at Riker’s Island, and you have an issue that poses as many questions as it does answers. Featuring the work of artists Stefano Caselli and Alex Maleey, with Color Artists Marte Gracia and Alex Maleev, Invincible Iron Man #593 ticks all the boxes visually and stylistically, and the transition between artists and color artists doesn’t impede the overall enjoymenty of reading the issue. The panel layouts are straightforward, nothing fancy, the characters and location are well realized, and there’s a nice jaunt around the Marvel Universe as everyone concerned ponders who ya gonna call when Tony Stark goes missing!?! Although there’s probably enough story in this issue for a couple of issues, for me though, the standout scene was between Victor and The Thing, where some especially scathing home truths are finally aired – and about time too! Ok, now I’m a big fan of Iron Man / Tony Stark. However, I wasn’t impressed with his fate at the end of Civil War II, Riri Williams was ok as Ironheart, but I didn’t really warm to Doom being the Infamous Iron Man that much, and having skipped Secret Empire completely I’m hoping that The Search For Tony Stark Part 1 sets things up for Tony’s return as the one, true, Iron Man. The question is, is that what’s happening here in this issue? That’s something this issues surprise ending will certainly leave us guessing about for now. While the story is adequate enough, I was hoping the art would be a bit more spectacular, but it’s still a fairly good issue for fans and newcomers alike. Suffice to say; if Marvel Legacy is all about getting back to the core mechanics, ethos, and distinctive look of Marvel’s most iconic characters, then Invincible Iron Man #593 is definitely a step in the right direction. Yes, there’s a new armored hero on the block in Invincible Iron Man #1, and her name is Riri Williams! Marvel Now continues apace in the wake of Marvel’s Civil War II as Brian Michael Bendis, Stefano Caselli, and Marte Gracia bring us the adventures of Riri Williams, Marvel’s new hero from Chicago, Ironheart! Having a new character stepping into the role once held by a long-standing character is nothing new in comics. 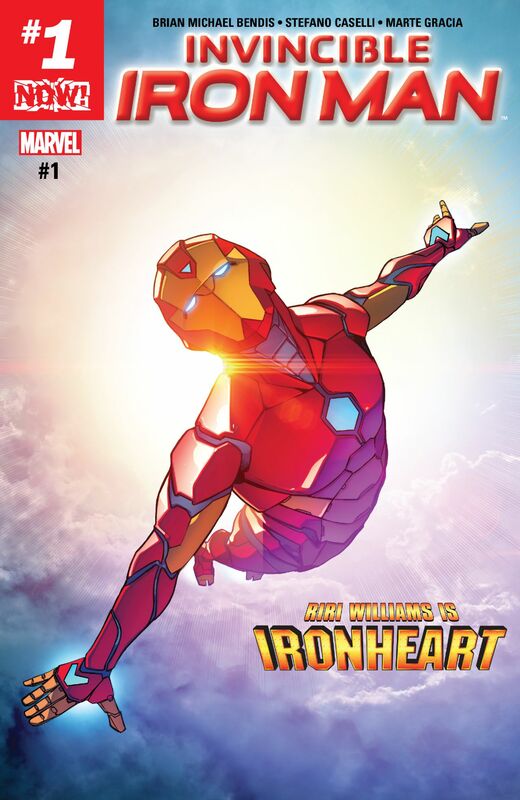 Invincible Iron Man #1 marks the beginning of a new era with Riri Williams taking centre stage after writer Brian Michael Bendis had already firmly established her character in the previous volume of Invincible Iron Man. It is this cleverly constructed groundwork that has made Riri‘s, as well as Victor‘s, gradual integration into Tony Stark’s life, seem all the more believable, and not just another change for change’s sake scenario as the Iron-Mantles are effectively passed to Riri Williams and Doctor Doom respectively. From the opening video-blogger style credit page opening, Brian Michael Bendis gives us an insightful and moving glimpse into the life and times of Riri Williams. The battle with the rogue monster-spawning mutant Animax fills the prerequisite action quota for Invincible Iron Man #1, with our rookie super genius Iron-heroine quickly realizing the limitations of her cobbled together armor, sans a properly efficient AI, but it is the fascinating glimpse into Riri’s formative years that really forms the backbone of the issue. Bendis skilfully intercuts the present-day events with some especially moving flashbacks to drive the narrative, highlighting some of the stark parallels and difficulties associated with being a super genius, while the more powerful themes and their heartbreaking aftermath resonates strongly on every level. Even though we’ve known Riri Williams for a while now, this issue really expands our knowledge of the character in ways that few could’ve predicted, and it makes Riri’s debut here feel all the more impressive as she sets out to make her presence felt in the Marvel Universe! Stefano Caselli’s artwork conveys the finer nuances of Bendis’ script beautifully. Page layouts are keenly structured to match the emotional beats of the story and the characters are all defined in the highest detail. The scene between the young Riri and her new friend Natalie are wonderfully staged. There’s tragedy and heartbreak for Riri too, and Caselli’s art makes you feel like you are there with Riri every step of the way as her life unfolds before you. The fight with Animax is also good, but it is what transpires directly afterwards that probably resonates the most – with its gun crushing finality grittily polarizing the impact of the flashbacks in our minds eye. Color artist Marte Gracia employs bright, vibrant palette of colors throughout, nicely complementing Stefano Caselli’s artwork with a blend of rich shades and tones to bring added highlights to virtually every scene. The issue rounds off with a great scene between Riri and her mother that effectively brings Riri’s story full circle. As for Tony Stark..? Well, he might not be around anymore, but you know Tony, he has a knack of thinking of contingencies for everything! I must admit, as much as I love the character of Riri Williams, I was a little sceptical about her taking over as the lead character in Invincible Iron Man. I’m pleased to say that Brian Michael Bendis has won me over once again with his superb storytelling and characterization skills. One thing that shines through is the sheer hope and optimism Riri Williams brings to the title, which considering the events in those flashbacks, shows just what strong and delightfully positive character traits Riri Williams will bring to the Marvel Universe. Invincible Iron Man #1 revamps the status quo and provides a confident start to Riri’s brand new adventures. Even though I’m sure Tony Stark will return as Iron Man eventually, we can rest assured that the legacy of Iron Man is in safe hands, so here’s hoping that Riri Williams will be around for a long time to come. Marvel’s bold Marvel Now iteration brings us Infamous Iron Man #1, the brand new ongoing series from the acclaimed Eisner Award winning team of Brian Michael Bendis and Alex Maleev. Yes, there’s a new Iron Man, and his name is… Victor Von Doom! That’s right, Doctor Doom, one of Marvel’s greatest villains, has decided to become something new, and to do that he must succeed where Tony Stark failed. But is there more to Doom’s plans, is he really a reformed character, and how will the world react to this new, infamous hero? 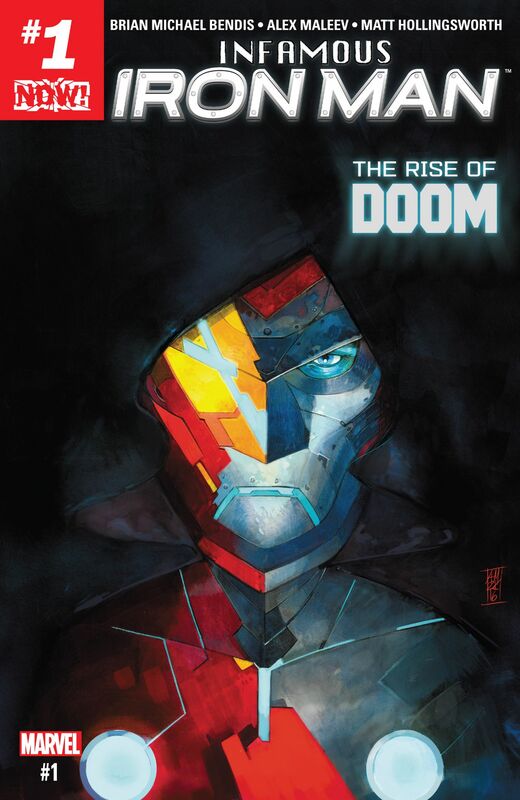 Ever since Victor Von Doom started turning up unannounced in Tony Stark’s life during the previous volume of Invincible Iron Man, the tumultuous events of Civil War II have had major consequences for Stark, and now Doom’s mysterious plan continues as he strives to reach even greater heights of power as Iron Man – but for what end? Infamous Iron Man #1 starts off with a flashback to a shadow meeting of the dark Cabal fronted by Doom, and it’s a scene in which writer Brian Michael Bendis skilfully eschews the narrative via Doom’s POV, offering us an insightful glimpse into Victor’s inner motivations as Bendis seamlessly entwines the new status quo post Civil War II with the intriguing premise of this new series. From there we are given a taste of the sublime blend of science, sorcery, and dry wit that will no doubt become the hallmark of this series as Victor’s character works towards assuming the mantle of Iron Man. Victor spends most of this issue keeping us, and everyone around him, unsure of his true motives, even when he performs good deeds, such as rescuing a high-ranking S.H.I.E.L.D operative with contemptuous ease from a former adversary, we are left with no doubt that Doom’s actions are still firmly in his own best interests. 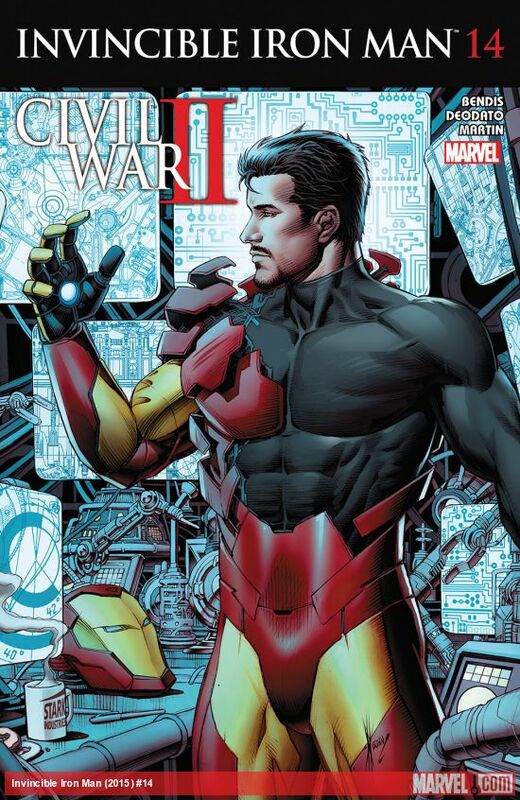 Its this mix of uncertainty and deceptive charm that makes Victor such a compelling and complex character, the brief interlude with Stark’s former girlfriend, Doctor Amara Perera, is also of note, as it offers some tantalizing snippets about what’s happened to Tony Stark and foreshadows Victor’s interested in Amara and her work. Alex Maleev’s artwork perfectly encapsulates the mood and tone of Infamous Iron Man, right from the first page we experience the Doom of old, before the scene shifts dramatically into the rescue mission, and it is here that Maleev really excels in these dark shadowy moments as we see Victor confront and beat down a villain with a calculated use of technology and magic. The colors by Matt Hollingsworth bring accentuated flourishes and tone to every moment, picking out striking hues of light and energy that punctuates the darkness. The scenes with Amara and Victor in the University of Cambridge seem bright and breezy by comparison, there’s an ever-loving-blue-eyed special guest appearance to watch out for, and Maleev and Hollingsworth engineer a classy build up to the inevitable moment when Doom finally gets to suit up as Iron Man. Brian Michael Bendis keeps us guessing almost until the end of Infamous Iron Man #1 before we begin to get more insight into what has happened to Tony Stark, it’s cleverly done too, and turns out to be something that bizarrely manages to be both expected and unexpected all at the same time. If anything, the scenes that lead up to Victor donning his Iron Man armor feels almost underplayed to deliberately keep us on the back foot. Infamous by name and infamous by nature, as first issues go, Infamous Iron Man #1 gets everything off to a good enough start. I guess maybe I was just expecting Doom’s debut as the Infamous Iron Man to be a little more exciting than it actually turned out to be. Still, that killer surprise ending certainly puts a whole new spin on things, offering up lot of potential, and hopefully the series can be infamous enough to live up to it. With the fallout of Rhodey’s death in Civil War II, his failure to make amends with Amara for faking his own death, the destruction of Stark Tower, and with Victor Von Doom doing his level best to become part of Tony Stark’s life over the course of this series, Invincible Iron Man #14 is the culmination of a remarkably intense and trying period in Tony Stark’s life as the Invincible armored Avenger – Iron Man. Though the success of Tony’s wish to find out what Victor Von Doom really wants from him remains somewhat undetermined, Brian Michael Bendis does a terrific job rounding off a number of key plot elements with this issue, deftly juggling the cataclysmic skirmishes of Civil War II whilst simultaneously paving the way for a new era to bring this volume of Invincible Iron Man to a close with a fittingly dramatic and exciting finale. 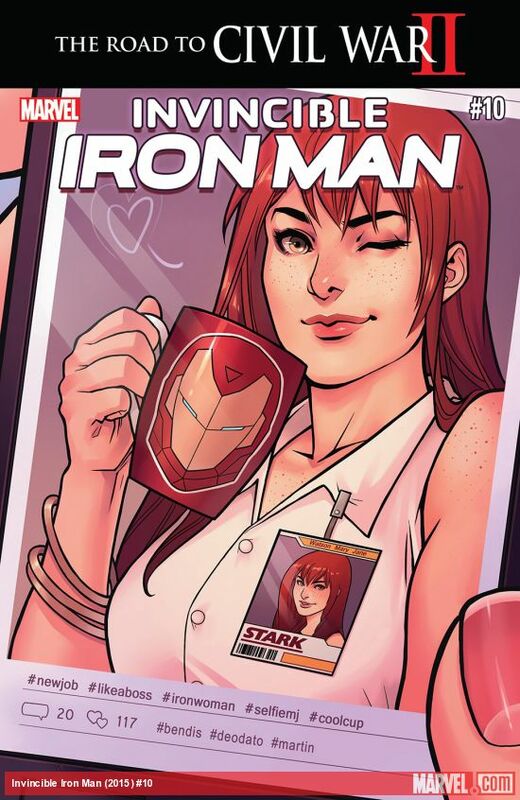 Indeed, there’s a lot of ground to cover, and some of Invincible Iron Man #14’s most poignant scenes come as Tony and Mary Jane discuss the future in the light of recent events. Tony’s clash with Carol Danvers over the Inhumans and the precognitive Inhuman called Ulysses in Civil War II – by using him to predict and counteract future dangers before they occur – has caused bitter divisions throughout the Marvel Universe. Tony now clearly feels that his demons in a bottle have found some new triggers, and with the future calling – quite literally – he needs to seek out an open meeting to work things out – a fact which is made all the more ironic as Stark is now effectively Carol Danvers sponsor. It is at this very same open meeting that Tony finds himself faced with some especially pertinent contemporary themes. Bendis skilfully weaves these powerful issues into the narrative of Tony’s current situation, uncannily resonating with and eclipsing his experiences on every level, and in many instances making Civil War II pale into insignificance by comparison. Ironically Tony’s wish to avoid Carol Danvers proves to be the catalyst that ultimately forces them to confront their different viewpoint head on. These scenes form the basis of this remarkable character driven issue as Tony and Carol address what it is they are really fighting for, what they believe in, Rhodey’s death, and of course Banner’s shocking demise. Some uncomfortable home truths are finally aired; where neither party likes or is really surprised by what they hear, and it’s clear that neither of them is going to back down. Mike Deodato produces an outstanding issue with artwork that will effortlessly immerse you in the heart of the drama. From the opening collage of media reports overlaying the sombre setting of Stark’s lab, Deodato forges an intense, emotionally charged atmosphere as events unfold across compact and impressively detailed page-layouts. It’s this precise, almost casual simplicity, which makes the issue works so well and gets right in your face – so to speak. The expressions of all the characters are beautifully rendered and you will be hanging on their every word. Color artist Frank Martin’s subtle use of tone and shade also works in perfect harmony with Deodato’s art; matching every emotional beat of Bendis’ script to absolute perfection. Tony’s final scenes in this issue is the sum total of what this arc has been building towards since the beginning, its marvellous how so much is said by saying so little, and the surprise visitor in the coda heralds a game changing development… I’ve thoroughly enjoyed this volume of Invincible Iron Man. In some ways it’s shame it has to and end as Brian Michael Bendis and Mike Deodato have been such a great team. 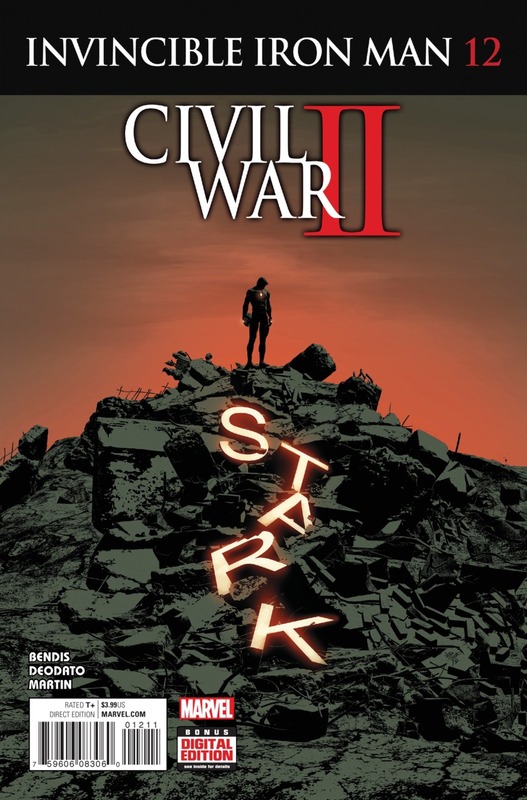 From the War Machines arc, to the Road to Civil War II, and these recent Civil War II tie-in’s, Bendis and Deodato have done exceptional work with this series and Tony’s character, and their run ends by setting up a very exciting future. Invincible Iron Man #14 is a brilliant, emotional, and powerfully themed issue. 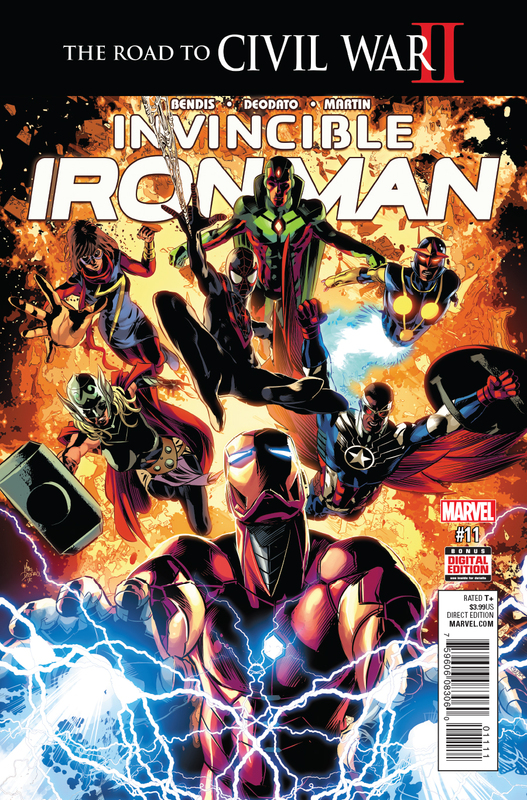 It may mark the end of this run of Invincible Iron Man, with Civil War II and Tony‘s whereabouts still to be resolved, but with Brian Michael Bendis and Stefano Caselli charting Riri Williams adventures as Ironheart in Invincible Iron Man #1, and Bendis reuniting with Alex Maleeve to bring us Doom’s story over in Infamous Iron Man #1, the saga of Iron Man is about to enter a bold new era and I‘m extremely excited for what the future will bring. The end of an era draws nigh in Invincible Iron Man #13 as the ramifications of Civil War II begin to impact drastically on Tony Stark’s life. Rhodey’s death has increased Tony’s rancour with Carol Danvers and the Inhumans over the precognitive new Inhuman called Ulysses. Now recent events have left Stark Tower in ruins. However, the sudden arrival of reformed super-villain Victor Von Doom with an offer to show Stark what to do next could change everything, but will this spell the end of Tony’s company and Iron Man as we know it? When it comes to a Civil War II tie-in, writer Brian Michael Bendis certainly delivers the goods in spades with Invincible Iron Man #13 as the fallout from the destruction of Stark Tower begins to settle over the Marvel Universe. After Victor Von Doom suddenly turned up to whisk Stark halfway across the world yet again, Tony finally gets to try and apologize to Amara for faking his own death, but it a reunion fraught with tension and hurtful asides that cannot be unsaid. This is a powerful, moving, and often deeply emotional issue at times, as Brian Michael Bendis gives us a stark portrayal of Tony as he finally addresses his grief over Rhodey’s death head on. Viewing Colonel Carol Danvers worldwide broadcast on behalf of the Ultimates, where she deftly skates around the details of her new peacekeeping campaign to prevent disasters before they happen, only serves to fuel Tony’s simmering mistrust and rage even further. The artwork by Mike Dedato is as beautifully rich and detailed as ever. Each scene flows seamlessly into the next, with smooth, refined page layouts that complement the narrative pace of Bendis’ story perfectly. From Tony and Amara’s frosty reunion, the flashback to the moment Tony went to see Rhodey’s body after he died is skilfully interspaced with events in the present as he views Carol’s broadcast to the world. The blend of raw emotions, spanning Tony’s heartrending grief, anger, and unwavering conviction, are all sublimely portrayed here by Dedato, and it all culminates in one little panel of silence tucked away in the corner of a page that conveys more than any words could say. The tones and hues color Artist Frank Martin uses throughout this issue are utterly superb, from the shimmering amber shades of Carol Danvers broadcast, the vivid grandeur of Rhodey‘s memorial service is masterfully juxtaposed with the gloomy scenes in Tony‘s lab, along with Mary Jane’s brief, yet poignant appearance, and the flashbacks featuring Tony and Rhodey are a wonderful example of how story, art, and color can combine to produce a sublime fusion of emotion and nostalgia in the most moving way imaginable. Ever since this volume of Invincible Iron Man began, the reformed Victor Von Doom has gone out of his way to become part of Tony’s life, usually appearing at moments that allow Victor to capitalize on or influence a given situation. While Victor’s motives remain unclear, this issue makes significant inroads towards the reasons for Victor’s uninvited appearances, and this time it wont be something that he can simply just walk away from either. Invincible Iron Man #13 is another strong tie-in issue with Civil War II. Although its light on Iron Man action insofar as Civil War II is concerned, this issue is really more about Tony’s and Rhodey’s friendship, and the flashbacks of them in action as Iron Man and War Machine is one of the undoubted highlight of the issue, and it all rounds off with an unexpected face off that is sure to leave someone with some serious explaining to do. Invincible Iron Man #13 is another terrific issue from Brian Michael Bendis and Mike Deodato, with its powerful storyline and striking artwork; this is an engrossing issue that works on every level. The biggest upheaval in Iron Man’s history begins in Invincible Iron Man #12 as the events of Civil War II start to tear Tony Stark’s world apart. This issue is a major Civil War II tie-in, divisions have formed, and concerns are mounting that Tony is about to go to war with Captain Marvel because of the precognitive Inhuman known as Ulysses! But Tony’s role as Iron Man and the fate of his company will soon hang in the balance, and what has Doctor Doom been planning as all-out Civil War strikes the Marvel Universe? 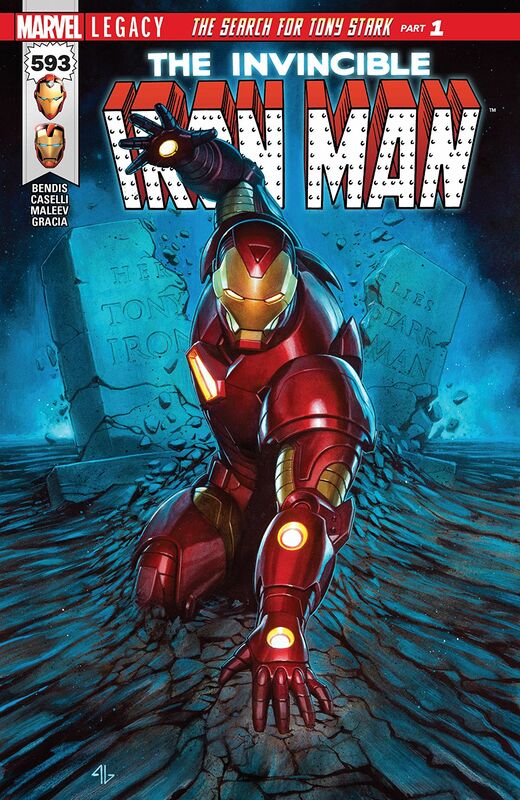 From the moment you see this issue ominous looking cover by Mike Deodato, featuring a dark figure with an arc reactor stood atop a pile of rubble strewn with the Stark logo, it’s clear that some major upheaval is waiting in the wings for Tony Stark. With the recent announcements from Marvel that 15 year-old MIT student Riri Williams is all set to become the new Invincible Iron Man post Civil War II and that Victor Von Doom will also become the Infamous Iron Man, Tony Stark will soon be replaced by two brand new Iron Men! The build up to these sweeping changers starts here in Invincible Iron Man #12, as writer Brian Michael Bendis kicks everything off with some pretty cataclysmic developments over at Stark Tower. From here we flashback to a press conference held weeks ago in the same aforementioned building, where Tony Stark apologized to his investors and employees for faking his death so that he could assist S.H.I.E.L.D and the Avengers with the international terrorist threat poised by Techno Golem Tomoe and her biohack ninjas in Japan. I love the way that Bendis handles the scenes where Tony confronts his board of investors. The dialogue is witty and sharp, some major home truths are aired on both sides, but even with MJ and his AI Friday to back him up, it’s clear the board isn’t going to let this one go without a fight. Mary Jane Watson and Friday also make a great team here, and they certainly keep Tony on his toes! If all that wasn’t enough, Tony also has some making up to do with new love interest Amara as well, something which proves far more elusive to resolve than expected. Mike Dedato’s brilliant artwork skilfully conveys the emotional depth and narrative of this tautly scripted issue. His work on Invincible Iron Man continues to play to Bendis’ strengths as a writer. This issue features some gorgeously detailed page layouts: the apocalyptic opening scenes amidst the swirling rubble and dust are hauntingly powerful, the press conference and scenes in the lab flow with seamless precision, our first glimpse of Riri Williams home life with her mother in Chicago are another big highlight of the issue, and the raw emotional roller coaster ride of scenes which later follow as Stark’s world begins to come tumbling down around him are magnificently depicted. Color Artist Frank Martin once again excels, velvety earthy tones and dusty greys dominate the early scenes, while the use of dusky shadows and refined hues delicately accentuate the diverse range of emotional beats of that make this issue such a compelling read. That wonderful first meeting between Riri, her mother, and Tony is certainly a defining moment for everyone involved. It’s great to finally learn more about this 15 year old genius M.I.T student, her mother certainly seems a force to be reckoned with as well, and we also discover something rather poignant about Riri’s name too. Invincible Iron Man #12 finishes where it begins. It is here that we actually witness the most powerful scenes, as Tony addresses Rhodey’s death – which tragically happened in Civil War II #1 – and his thoughts about Carol Danvers and the Inhumans are revealed to a somewhat shell-shocked audience amidst the ruins of his life – and it is in these moving scenes that Brian Michael Bendis’ stellar writing will leave you hanging on Tony’s every word. This run on Invincible Iron Man by Brian Michael Bendis and Mike Deodato reaches even greater heights with this issue. While it might be light on actual Iron Man action, the drama, suspense, and impeccable characterization are elevated to a whole new level with this Civil War II tie-in, and the cliff-hanger ending looks like it has the potential to be a real game-changer for the series. Invincible Iron Man #12 branches out into the wider arc of Civil War II with assured confidence and paves the way for even bigger events to come! Civil War II steadily advances in Invincible Iron Man #11, as Tony’s undercover mission in Osaka brings him ever closer to infiltrating the Techno Golem Tomoe’s terrorist cell of biohack ninjas. Meanwhile, as Mary Jane Watson attempts to prevent Tony’s company being taken over by the board of investors, Rhodey has been busy developing an Avenging contingency measure of his own, because Iron Man is going to need his allies more than ever as the storm clouds of Civil War II gather on the horizon of the Marvel Universe. It all kicks off in Invincible Iron Man #11 as the Road to Civil War II marches inexorably on. Writer Brian Michael Bendis skilfully maintains the fine balance between several key plot threads that have been running parallel to each other over the course of The War Machines story-arc, now everything begins to come together, and the net result is a densely plotted issue where the drama, characterization, and action fuse seamlessly as one. Beginning with a power walk of investors storming into Stark Headquarters to wrest control from Tony’s AI, Friday, they plan to use the criminal, Ghost, to beak into Stark’s lab and gain access to the servers. Fortunately, Friday also has an ace up her digital sleeve, namely, Mary Jane Watson, and the way MJ and Friday collectively defuse the situation with the board of directors is absolutely priceless. Events also took a startling turn last issue when Richard Franco (Tony) finally met Tomoe, and discovered she was an Inhuman with the ability to control live technology. Tony may have elaborately faked his own death to gain access to Tomoe’s organization (by utilizing some nifty facial disguise software to become Ex-S.H.I.E.L.D agent Richard Franco ), but Rhodey, S.H.I.E.LD, and the all-new all-different Avengers have formed a plan of their own – the only question is will they be going to Japan to rescue Tony Stark or to avenge him? Engaging characterization, though-provoking dialogue, and big action set-pieces are the order of the day in Invincible Iron Man #11, as Brian Michael Bendis interspaces the narrative with some wonderfully crafted moments: primarily a clandestine meeting between Tony and Rhodey where not everything is quite as it seems, and there’s even an interlude with new armored superhero, Riri Williams, as she makes her first foray into being a superhero. The artwork by Mike Deodato during this story-arc has been astonishingly good; indeed, Invincible Iron Man #11 is arguably one of Deodato’s finest issues on the series so far. Mike Deodato and Brian Michael Bendis make a fantastic team, Deodato intuitively bring every nuance of Bendis’ exemplary storytelling and characterization to life on the page. From the moment that Mary Jane makes that head-turning entrance in the lab, she proves what a worthy addition her character is to this series’ terrific ensemble cast. Likewise, Deodato ramps us the tension with glorious views from Tomoe’s penthouse in Osaka, as the Techno Golem and her trusted right-hand-lady, Zhane, realize that their organizations closely guarded anonymity has been compromised. Frank Martin’s colors are another big highlight of the issue, with sumptuous tones and shades heightening the atmosphere of key scenes, before exploding into vivid hues when the bombastic action kicks into overdrive as War Machine, S.H.I.E.L.D and the Avengers enter the fray. Invincible Iron Man #11 rapidly builds towards a rousing final act, however, Tony’s undercover identity still has an important role to play, and the powerful coda certainly gives us plenty to ponder over in the final moments. Now that Civil War II is well under way, there are some events during this issue – and indeed throughout the entire arc – which now seem far more poignant and insightful in hindsight given the events of Civil War II #1. After all the build up and mystery surrounding Tomoe and the biohack ninjas, Invincible Iron Man #11 does feel a little like its racing towards the finish line to catch up with Civil War II, but that’s only a minor quibble, and the conclusion actually proves as equally satisfying is it is ambiguous. 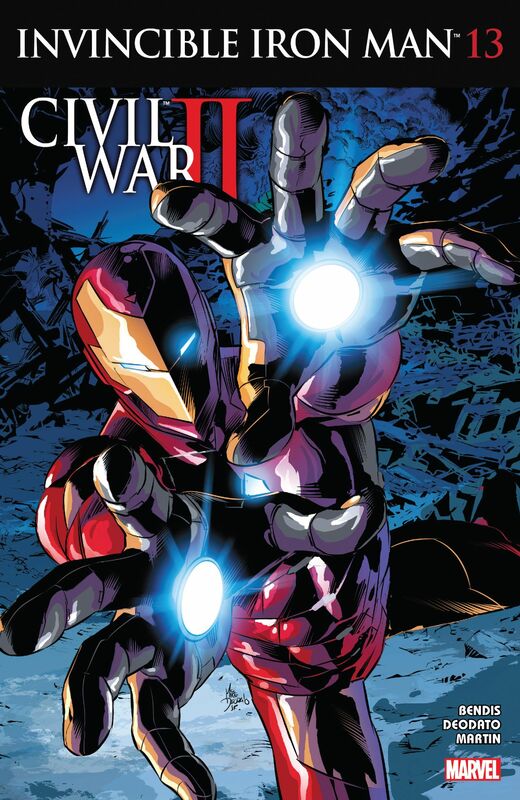 Brian Michael Bendis and Mike Deodato have done an amazing job with this issue, The War Machines and Road to Civil War has been a terrific Invincible Iron Man storyline, now everything is set for the next issue, and the first of the Civil War II tie-ins! The road to Civil War II continues in Invincible Iron Man #10, with Tony working undercover in Osaka alongside Rhodey to deal with the deadly threat posed by the biohack ninjas, Iron Man needs his allies now more than ever as Civil War ominously encroaches on the horizon of the Marvel Universe. Get ready for an emotional and action-packed issue of Invincible Iron Man as Tony Stark’s world is shaken to the core. The War Machines story-arc and the Road to Civil War II converge inexorably in Invincible Iron Man #10, as writer Brian Michael Bendis effortlessly builds the suspense, and numerous plot strands are drawn together as Tony’s plan to infiltrate the biohack ninjas led by Techno Golem, Tomoe, enters its next phase. So, when the biohack ninjas come knocking on Mister Richard Franco’s (AKA Tony Stark’s undercover identity recently assumed with the help of some advanced facial disguise software) door in Osaka, it begins to look like Tony might’ve bitten off more than he can chew. Fortunately he‘s got Rhodey to watch his back. Meanwhile, Tony’s A.I, Friday, is managing his company in his absence. But with the board of directors attempting to seize control following news of Stark‘s apparent demise, it now falls to Mary Jane Watson, who recently turned down the job offer to become Tony’s assistant, to make the toughest decision of all. This is another impressive tightly plotted issue from Brian Michael Bendis. From Tony’s / Franco’s abduction, tinged with hints of colourful language and a hilarious “stinky” mask thrown in just to add insult to injury, the wry humour and banter with Rhodey soon gives way to the brooding menace of Tony’s confrontation with Techno Golem, Tomoe. Its ingenious how Bendis makes the scenes with MJ in New York proved such an equally powerful and poignant contrast with Tony’s mission in Japan, as billboards, a web-swinging cameo, and an unexpected request for help bring MJ to reflect on both her life and career. The AI, Friday, is another character that really shines in this issue, as her role becomes more pivotal than ever. Mike Deodato’s art work for Invincible Iron continues to impress on every level. With some concise page layouts that are both elegantly structure and packed with detail, the plot unfolds rapidly between Japan and New York, each resonating with the drama and emotional beats of the other in perfect unison. Mike Deodato and Brian Michael Bendis have infused this issue with a mesmerising blend of action and suspense, as story and art fuse seamlessly as one. Gloriously realized two-page spreads punctuate key moment with vivid clarity, as the meeting in Tomoe’s stunning penthouse and a dazzling test of skill and endurance against the biohack ninjas make our jaws hit the floor with the sheer intoxication of their spectacle, while color artist Frank Martin’s exquisite use of tone and shade throughout immerses your imagination in every scene. The issue juggles a lot of plot threads and delivers just as many revelations as it does unanswered questions. I particularly liked how MJ’s arc is leading the character towards a much stronger role in this series. Mike Deodato and Frank Martin’s fun cover for Invincible Iron Man #10 had me expecting something more frivolous, however, the emotional impact of Mary Jane’s scenes in this issue are handled perfectly, and it is those same quiet, reflective moments – where things remain unspoken and introspective sideways glances melt your heart – which actually reveal far more than words mere could ever hope to describe. There’s also a brief interlude with new armored superhero, Riri Williams, Tony uncovers a surprising secret about his captors, and Rhodey is standing by jut in case Tony’s plan to infiltrate the techno-terrorists goes pear shaped. Invincible Iron Man #10 is another incredibly strong issue from Brian Michael Bendis and Mike Deodato, with its plethora exciting plot developments, stunning visuals, and awesome surprise final page, this is one issue on the road to Civil War II that you certainly wont want to miss! Iron Man may have called on Spider-Man’s help to find Colonel Rhodey in Japan, but rescuing Rhodey from techno-golem Tomoe and her biohack ninjas didn’t prove quite as straightforward as expected. Tomoe is able to attract and assimilate all forms of technology, including Rhodey’s and Tony’s armor, and even Spider-Man’s web shooters! With Tony’s suits AI, Friday, unable to counteract this new technology, Tomoe initiated a cataclysmic explosion to destroy them all. Now, writer Brian Michael Bendis delivers further action-packed developments as Invincible Iron Man #9 takes The War Machines arc to whole new level of excitement and intrigue. Invincible Iron Man #9 begins with Tony Stark MIA, shares in his company have plummeted, and that’s just the tip of the iceberg, as Brian Michael Bendis surreptitiously casts a veil of mystery and suspense over what has really happened to Tony Stark. The War Machines Part 4 might not be wall-to-wall action like the previous issue, but it makes up for it with some brilliantly crafted character moments: with Friday dealing with an irate shareholder, an immensely thought provoking interlude with Doctor Amara Perera and the reformed Victor Von Doom, and Rhodey’s return visit to the secret underground nightclub in Osaka to get information about Tony’s whereabouts from its wheelchair bound proprietor – the mysterious Miss Yukio. The most startling scene is that aforementioned meeting of minds between Victor and Amara, as advancements in her research into Alzheimer’s disease remains elusively beyond her grasp. Its a matter further compounded for her because of Tony’s disappearance, even news reports that Peter Parker has his best people searching for him offers little comfort, but it is the way Doom gains access to her lab that initiates the most fascinating debate of all. The startling juxtaposition between science and magic Bendis strikes in their conversation becomes intermingled with the ethical, moral, and potentially far-reaching consequences that reside in the core of Doctor Amara Perera’s argument with Victor Von Doom, and we are left wondering just how far she is prepared to go to compromise her principles in order to see her research move towards human trials. Mike Deodato’s artwork for this issue is as captivating as it is dynamic. Deodato’s art brings added emotion and intensity to this densely plotted issue from Bendis, it’s almost as if they instinctively play to each others strengths as writer and artist, and the result is one of the most gripping issues of Invincible Iron Man so far. From the pang of emotion on Friday’s face when she’s asked if Tony is dead, to the frenetic action when Rhodey goes looking for information in the club in Osaka, and the marvellous scene between Amara and Victor, this issue has it all. Color artist Frank Martin is also on fine form, delicate tones and velvety shadows are blended in perfect harmony with every beat of the story, effortlessly drawing us into the narrative, and the Rhodey, War Machine, and biohack ninja scenes are the action-packed highlight of the issue! Of course, the striking cover for Invincible Iron Man #9 by Mike Deodato reveals the debut of a brand new armored superhero, a woman, and the cover blurb reads: “OK, she doesn’t have a hero name yet – She’s working on it!” It’s certainly going to be the big talking point of this issue, but who is it? I won’t spoil it for you, but rest assured, everything – kind of – is revealed in this issue, it actually links back to scenes from earlier in The War Machines story-arc, and it skilfully sets up some really exciting possibilities for the future! So, where is Tony Stark? Well, after keeping us – and most of the characters – guessing, that question is indeed answered in this issue, and it’s ingeniously done as well. Invincible Iron Man #9 is a tense, exciting, and thoughtful issue in The War Machines story-arc, Brian Michael Bendis is making Tony Stark’s work more compelling with every issue, it feels like we are building towards a real epic now, and with Mike Deodato’s excellent artwork and Frank Martin’s intricate colors, Invincible Iron Man continues to impress on every level and remains one of Marvel’s best new titles. The search is on in Invincible Iron Man #8: The War Machines Part 3, with Rhodey still missing in Japan after searching for the biohack ninjas that were tracking Madame Masque. Fortunately Tony’s new assistant / life coach Mary Jane Watson just happens to have Peter Parker’s emergency phone number, enabling Stark to call on Parker’s wall crawling bodyguard for assistance. Iron Man and Spider-Man must team-up to rescue War Machine, and somehow find a way to stop a deadly new menace to the Marvel Universe! Its repulsor rays to maximum power and web-spinning action all the way as Brian Michael Bendis brings two of Marvel’s most iconic characters together in Invincible Iron Man #8, as Iron Man and Spider-Man join forces in Tokyo to find Rhodey. Following a quick flight across the Pacific, Iron Man soon encounters Spider-Man, and together they discover a clue that might lead them to War Machine. Bendis crafts some really fun moments between Iron Man and Spider-Man in this issue. The banter between them is priceless at times, with Tony being all serious – at least initially – in the face of Spidey’s wisecracks, but is not long before the jokes and flip remarks eventually send them on a path to becoming an even funnier superhero double act as they confront Rhodey’s captors. Tony’s shape-changing Iron Man suits AI, Friday, is also beautifully written by Bendis in this issue, and it feel like she’s really evolving into a major character in her own right now. Friday gets some great lines of dialogue, especially once Iron Man and Spidey team up in Tokyo, and in a brief flashback the AI has an interesting scene with a less than impressed Mary Jane Watson that ends on an especially poignant note. Having been stripped of his War Machine armor, Rhodey is now a prisoner of Tomoe and her biohack ninjas. Although we don’t learn much more about Tomoe over the course of this issue of Invincible Iron Man, it’s clear that her armor seems able to attract and assimilate all forms of technology, and it also mimics similar shape-shifting aspects of Tony’s armor. However, as Tomoe and the ninjas soon discover, Colonel Rhodes is not someone to be underestimated – even if he has to fight for his life wearing only his underwear! This is another fabulous looking issue from artist Mike Deodato and colorist Frank Martin. Set against the gleaming Tokyo Skyline and the industrial gloom of Tomoe’s shadowy lair, Mike Deodato has clearly had a blast drawing this exciting team-up between Iron Man and Spider-Man. The level of detail bestowed on the Iron Man armor is astounding, Deodato also draws a great Spider-Man as well, and I love the scene where Spidey’s mask is reflected in Iron Man’s faceplate – you can just imagine the look on Tony’s face underneath. Rhodey’s fight against the ninjas also proves to be a big highlight of the issue as well. Frank Martin lavishes every page with a sumptuous palette of colors, blending vivid tones and inky shadows to bring added intensity and atmosphere to each scene. Deodato and Martin’s work is perfectly in key with the beats of Bendis’ script, balancing the humour and drama perfectly, there is some terrific moments of characterization, and the electrifying face-off between Iron Man, Spider-Man, Rhodey, and Tomoe is brilliant! Facing jetlag, embarrassing boxers, and a technology that even Friday is unable to counteract, Iron Man, Spider-Man, and Rhodey must risk life and limb as they battle Tomoe and the lethal biohack ninjas that are out for their blood. Invincible Iron Man #8, with its exciting action-packed story by Brian Michael Bendis and excellent art by Mike Deodato, is another hugely impressive issue in The War Machines storyarc, and its thrilling cliff-hanger ending is guaranteed to leave you on the edge of your seat until the next issue.